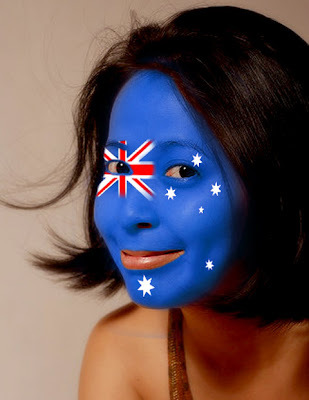 The Artist Chef: Australia Day! Today the entire nation down under is having their official holiday and having a good time. So time travel of 8 hours from Sydney, here I am in Manila thinking of my own ways to celebrate this day. I also asked myself what Australia Day means for me to celebrate tonight. It was year 2000, when I first fell in love with the beauty of Australia. It was because of my friend who studied in UTS, Sydney who made me feel that way. He sent me e-mails narrating his life stories in Australia. He told me the places he visited, the people he met, the lifestyle he had and so on. He also sent pictures for me to visualize the beauty of the country who became his home for two years. It was his stories that inspired me to see Australia. I promised myself to visit my friend when he was still there. It didn't happen. I set aside that promise. But it was always there in my heart. Seven years later, finally I was able to go Australia. I stepped on the city of Brisbane for few hours, visited Melbourne for a week and resided at Sydney for a month. I embraced their culture and appreciated every single detail of their life. To my amazement about the life I had their for a month, it made me tell myself once more: "I promise that one day this is the place I will settle down and live the life I always dream of." It was a dream that will take two people to pursue. I thought this dream was shattered. I don't see it will happen anytime soon. But who knows what life brings? I will never find the answer today. Things happen for a reason, I may not be able to embrace that thought now but the future will prove it's true. So, starting today I will never take away that dream in my heart. It will always be there. And it takes a positive thought for good things to happen and for me to reach my dreams. "Everything you want to learn about life is best learned with sand between your toes because life is a beach"
So tonight, let me celebrate by grilling my marinated pork in black beer with honey. 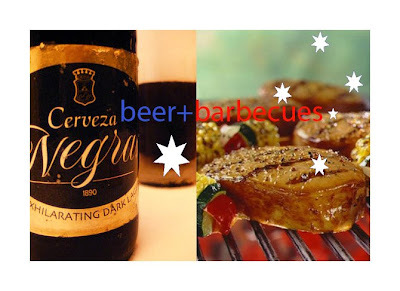 Things I learned during my barbecue class in Sydney. And let me use my blender to come up with my Frothe Cerveza Negra with lemon and honey. Isn't that a feast for dinner already? And who wants to join me for dinner tonight? We had a bit of a barbie with my Australian friends and ate trifle this evening! Very Aussie, aiegh?! I'm already full, but I really wanted to join you for a dinner feast tonight! Wow! i like this post, joanie. there are times when am guilty about planning things too much.. but now i have learned to control myself. we have to be positive about life, and just enjoy every moment of it. and motto ko nga as shared with paulo, ay life is a party, and why not!!! HAHAHA! -G'day! Had a blast last night with my black beer and barbies! The infused flavor of beer and honey made my pork juicy and flavorful. My guest loved what I cooked. So he went home very full. -Bagong motto mo na yan? Kaya pala panay ang party. Kung kayo ni Vi panay party, mine is simple. Dumidinner lang. Quiet lang. I never thought magkikita pa uli tayo. Salamat sa kwento. Sana nakapagdulot ako ng ngiti sayo kahit papano.